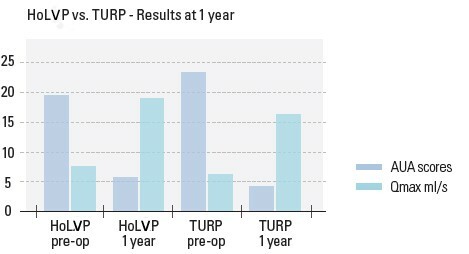 Holmium Laser Vaporization of the Prostate (HoLVP) is a safe and effective BPH treatment option that provides immediate symptom relief with few complications6. The holmium laser penetrates just enough to precisely and quickly vaporize tissue without causing deeper thermal injury, coagulation necrosis or collateral damage7. HoLVP is a virtually bloodless, out-patient procedure that offers quick recovery time and a rapid return to normal activity7.